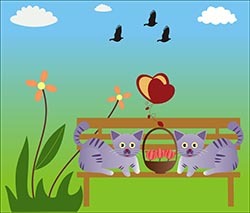 Download Latest Royalty Free Vectors from our gallery. You can use these vectors in your Personal and Commercial Projects. Colorful Icecreams Set: Colorful set of different ice creams. Illustration which can be used as icons, clip art etc and can nicely be embedded in your creative designs. Halloween card of Flying Pumpkin: Illustration of flying pumpkin happy Halloween card. Flying Pumpkin with wings eyes and mouth. Two happy kids planting and watering plants: Boy and girl planting little plant and watering. Environment friendly concept, Can be used in a variety of artworks.